work on a cassava plantation. 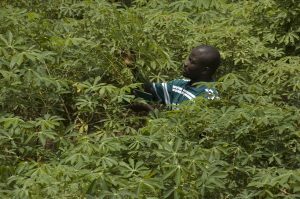 A team of IITA Scientists led by Wossen Assfaw, have documentary evidence to show that effective adoption of an agricultural technology reduces poverty, especially in the case of improved cassava varieties in Nigeria. Empirical evidence on the relationship between agricultural research and poverty reduction has suggested that improved agricultural technologies may not necessarily lead to poverty reduction as the poor are often constrained by structural barriers that make improved technologies inaccessible and less profitable for them. Therefore, understanding how and why farm households adopt improved varieties and their subsequent effects on productivity and poverty outcomes is important to the design of an effective pro-poor technology dissemination strategy. Over the years, there has been substantial investment in the development and dissemination of improved crop varieties and complementary agronomic practices in Nigeria by national and international research and development organizations. However, despite these major efforts and the importance of cassava for rural livelihood, there is a lack of comprehensive and rigorous evidence on adoption rates and impacts of improved cassava varieties on productivity and poverty related outcomes. 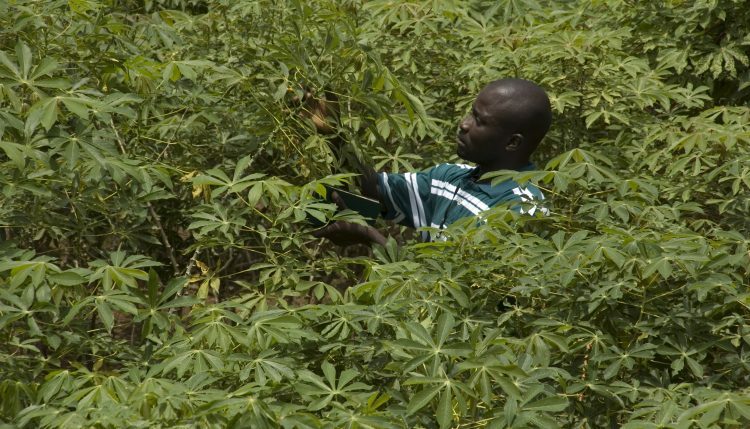 As a result, unique nationally representative adoption data was used to measure adoption rates and to estimate the poverty reduction effect of improved cassava varieties in Nigeria. First, DNA-fingerprinting was used to identify varieties grown by farmers as a more reliable measure of adoption. Using DNA-based adoption data, there was documentation of the extent to which measurement error in self-reported adoption status may bias the poverty reduction effect of adoption. Second, the use of Global Positioning System (GPS) to measure farm size. This is because self-reported farm size estimates by farmers might be prone to measurement error, which may affect productivity estimates and hence the estimated poverty reduction effect of adoption. Third, farm-level treatment effects were linked to a market-level model to measure the aggregate poverty reduction effect of adoption. In answering the key research question, “Does adoption of improved cassava varieties have an effect on poverty?”, the poverty reduction effect of adoption of improved cassava varieties was estimated using DNA-fingerprinted adoption data which showed that 1.62 million individuals have been lifted out of poverty due to adoption of improved cassava varieties. However, our results suggest that this estimate is sensitive to the measurement of adoption status, which means that proper measurement of adoption status is crucial for estimating the poverty reduction effect of technology adoption.